I've been having issues between 7 PM and midnight east coast time watching videos on my computer. At times I can't watch YouTube videos or Amazon Prime videos in 1080p resolution without studdering/buffering. I understand that this is probably due to a large number of users in my area all online at the same time. At that location in particular my ping consistently jumps around from 40ms to over 500ms. It seems to be a network issue causing my lag issues and ping spikes. I've also noticed when I play games online where my traffic isn't routed through cpe-174-111-120-013.triad.res.rr.com I rarely have lag issues and ping spikes. How can we get someone at Spectrum/Time Warner to fix this issue with their network? I'm in the Columbia, SC area. I have the 30/5 plan. My modem is the Arris SB6183. I'm using a Netgear wireless router with the ethernet cable from my computer plugged into the router. I have no background tasks running that use bandwidth. Changed the cable from the wall to my modem. Checked to see if I have the latest drivers for all of my hardware. Why could be a coaxial issue when the ping issue is obviously happening at an IP address on the Time Warner network in another state? We are trying to rule out anything in the cable plant at your end before pushing TWC to fix their network congestion. If you still have a need to challenge the method, post the complete tracert data so we can see for ourselves that you are drawing an accurate conclusion. Work with the forum on this, not against us. The last thing we need is for TWC to come back saying "You forum guys didn't even know how to read the data," or "The real problem is on the customer's end." If you look at my original post, it contains the complete tracert data through the pingplotter program screenshot. Right click on the image and open it in a new window. That's 10 minutes of tracert data run every 2.5 seconds. If you are unfamiliar with ping plotter, its a program that does a tracert and ping to a particular at a particular time interval until you tell it to stop. As you can see the ping goes back and forth between 19ms and 517ms. That IP is not WAY down the TWC/RR pipeline, it's sitting right next to your coaxial connection. And I'm going to be completely rotten and tell you to add in the Min and max columns in ping plotter as well, they help to see best vs worst timing. You should not be running 2.5 seconds either, change it to 5 or 10 seconds which will better display 3 second timeout data and Dynamic route changes. I reran pingplotter at 5 seconds and 10 secodns and got the exact same results as before. 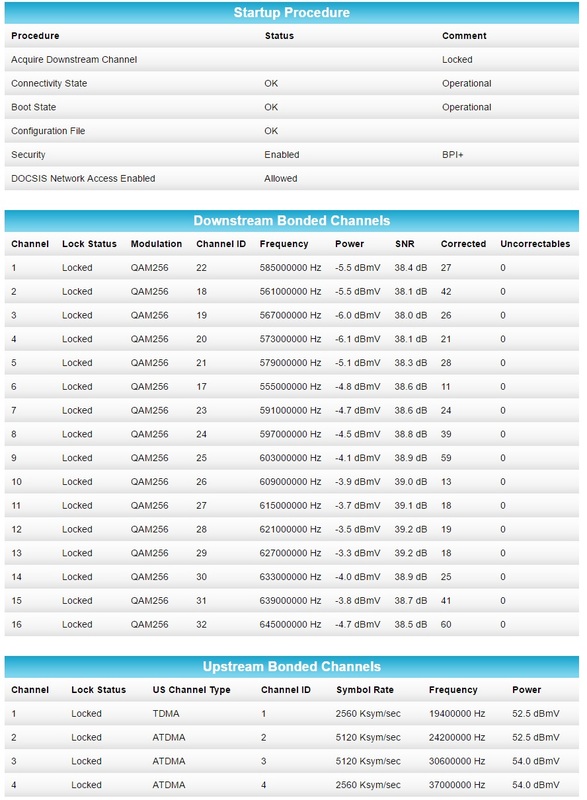 Here is the modem status page. Upstream s/b below +50 dBmv with +52 dBmv being the cutoff point. corrected count isn't bad but I have no idea when the modem reset itself. The levels need to be fixed before anything else, switching modems won't help... this is a level issue. It could also be corroded center wire in one or more F connectors, probably outside.